As parents, we want to see our children have a beautiful smile that lasts a lifetime. 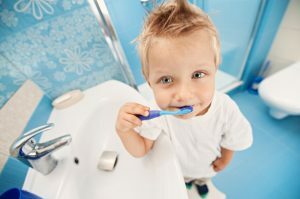 In order to increase the odds that your child takes their oral health seriously throughout their life, you need to start teaching them oral hygiene habits while they are young. As your children’s dentist in Virginia Beach, we are here to help you educate your children about the importance of oral health. We will work with you and your children to promote a lifelong priority of taking care of their teeth with a positive relationship with their dentist. Your children need to start learning how to properly care for their teeth and gums while they are very young. In addition to their home oral hygiene routines, they also need to visit the dentist regularly. In fact, it’s recommended children have their first dental appointment before the age of one. The earlier your child starts seeing the dentist, the more positive the experience will be. They will develop a relationship with us, allowing them to feel comfortable visiting the dentist. They will then carry this trust of the dentist with them into adulthood, allowing them to maintain their oral health as they age. Outside of the dental office, you need to make oral hygiene fun for your children so they actually want to do it. This involves more than just telling them about the risks of not brushing or flossing their teeth. You don’t want their oral care to feel like a chore. There are many fun ways you can make brushing and flossing exciting. For example, have your child pick out a toothbrush that interests them. With a toothbrush they love, they will be excited to use it. To ensure your child brushes their teeth for a full two minutes twice a day, find their favorite song. They can dance to the song as they brush their teeth. One of the most common areas that’s overlooked with children is flossing. Your children need to floss their teeth daily, but most children don’t enjoy it. To make it more enjoyable, floss your teeth together as a family. Your children will see that you take flossing seriously, so they should too. As your child brushes and flosses, be sure to teach them how to brush and floss correctly. For example, they should hold the brush at a 45-degree angle while brushing all surfaces of the teeth. They need to learn to pay careful attention to hard to reach places and cavity-prone areas like the molars. Teach them how to safely floss between each tooth without snapping the floss on the gum. At Smile by Design, we offer children’s dentistry in Virginia Beach. We work with you and your child to teach the importance of proper oral hygiene while we protect their smiles from damage. As a children’s dentist in 23462 areas, we provide the calm and gentle touch children need to enjoy visiting the dentist. Call us today at (757) 337-4665 to schedule an appointment.